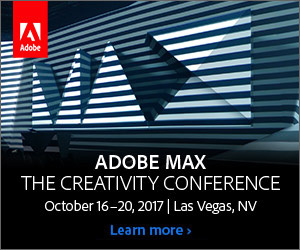 Adobe MAX 2017, The Creativity Conference – running from October 18-20 – will be chock full of expert keynotes and presentations, technical and how-to ses­sions, product announce­ments and sneak peeks, evening events and parties, networking and meeting the teams, and possibly some surprises… The show is an amazing experi­ence where they really take care of you from start to finish while you soak up all the growth and learning you can. In fact, many of the best courses and tutorial sessions from the last MAX were recorded and are still available on-demand for free viewing, covering all Adobe applications. What’s more, we’ve got a ProDesignTools-exclusive savings of US$400 when you register using promotion code PDTDP17. Using this MAX 2017 discount coupon code is open and available to everyone! Or, if you’re a new customer signing up for Creative Cloud, then you can do a little better and get US$500 off for new CC subscribers. Now back to our giveaway: We’ll be awarding one free regular full confer­ence pass to the grand prize winner (retail value US$1,595). Any travel and lodging arrange­ments are the responsibility of the winner. However, if you’d like to travel to Las Vegas for free this year (or anywhere actually), then we’ve got another great deal for you: sign up for a new credit card like this one and you can now receive 50,000 bonus frequent flyer miles – which is more than enough for a free roundtrip flight ticket anywhere within North America (using a Saver Award on United Airlines)… The annual fee is $95, a pretty good deal for the benefits. (3) Leave a comment here below telling us why you’d like to go to Adobe MAX, or if you’ve ever experienced it before. That’s it! Each of these actions counts as a single entry into the drawing – so if you do all four, you’ll receive four different chances to win the prize. Be sure your email is correct so that we can contact you. One entry per reader for each method, but be sure to share and tell your friends and colleagues who’d like a chance as well. Submissions are open until 11:59pm EDT on Thursday, August 31st, 2017. The winner will be drawn at random from all valid entries, and contacted via email or direct message – and we’ll announce the lucky recipient (first name only) right here the following week. The prize is in the form of a special, unique voucher that will give one complimentary full conference attendance. Adobe gives every MAX 2015 attendee a new high-end FUJIFILM X-T10 mirrorless camera. Offer valid through the close of Adobe MAX 2017 registration. Winner must be able to attend Conference to qualify. VOID WHERE PROHIBITED OR RESTRICTED BY LAW. Valid only for persons 18 and over with selection of one (1) full (three-day) Conference Pass to the Adobe MAX event occurring on October 18-20, 2017. Limit: one (1) discount per person; not available retroactively. To register and redeem the free full Conference Pass for MAX 2017 (reg. street price US$1,595), register at max.adobe.com (or register onsite at the event occurring on October 18-20, 2017) and provide the winning promotion code provided when prompted. Discount will be applied during checkout. Offer not valid with non-full (other than three-day) MAX passes, or for group, bundle, or volume purchases. Offer is subject to availability and may not be exchanged, sold, transferred; combined with any other discount or offer; or redeemed for cash or other goods and services. I love MAX, but as an educator I have limited professional development funds each year. It would be fantastic to win a free pass so I can continue bringing the most up-to-date information back to train the next generation of creative professionals! I have never been to Adobe Max before. For the last three years I have followed your speakers, and they are second-to-none. I want to prioritize my photography career and hope this is the year!! I’ve never been to Lost Wages, I mean Las Vegas, so I’m interested in winning the trip. Also, I need to learn more about using my Adobe products. I would like learn how to use the programs. I have been teaching myself by trial and error. It would be nice to be able to attendant the how-to sessions. I believe this event would allow me to network with other creative minds. I have been learning many of the Adobe products as I have found a need for a product only to find that it is in a program that I own by Adobe. I have the full suite of Adobe products, but I would like to learn more about what some of them do without trying to learn about them on the fly as I have been. I believe that attending Adobe Max would give me that opportunity. And, then there is the whole being in Las Vegas as its own benefit! I am not a gambler, but all of the different shows is what I enjoy doing when I go to Vegas! I have seen a few really great shows and that is something I always look forward to doing, so yes, to great opportunities in one great week! I’m enthusiastic about graphic design and I’ve been using adobe reader for sometime now. I learning to use adobe Photoshop presently. The opportunity to learn adobe creative tools and to meet professionals in the creative world would be too good to turn down. I look forward to be at this conference. I would love to attend Adobe Max this year. I don’t have many opportunities to be around other designers, as I’m the only designer at the nonprofit I work for. So Adobe Max would be a place where I can be a part of the design world. I would like to learn how to use the new tools Adobe plans to release in their future upgrades. I need that inspiration and knowledge to help make me a better designer. Thanks. Adobe is king at my work; The Max is all the rave. I’ve wanted to go to Adobe Max for years. I’ve never worked for a company that saw the value in sending the designers and I have not been able to afford to go on my own, so to win this would be a dream come true for me. I’m an educator and going to Adobe Max would be a tremendous advantage to help students understand Adobe Creative Cloud at a young age. We are testing out Character Animate with the preschool this week. I’d love to go so that I may become more proficient with the Adobe suite. As a student in Communication and Multimedia, I’d love the opportunity to attend Adobe MAX 2017 this fall to see the new Adobe products I’ll likely be working with next year, but also to meet some pros and connect with others in the field! I love interacting with the Adobe team because they hear my opinion and sometimes implement suggestions which is really great. It is also great to attend the sessions and get other Pros’s ideas and see what inspires them. The whole thing is just full of energy and inspiration. Our grand prize winner is Sherry B. from Ames, Iowa! 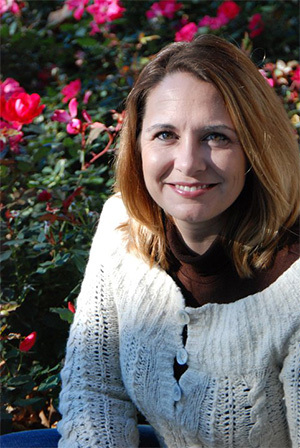 Sherry has just been awarded a compli­mentary full pass (value US$1,595) to the Adobe MAX conference this fall in Las Vegas. Congratulations to Sherry, and thanks to every­one for being part of our latest giveaway… A special thank you also goes out to Adobe for generously sponsoring this promotion. If you didn’t win this time don’t worry – stay tuned for our next contest coming soon! Photography is my creative outlet and stress release from my full time job as a cardiac RN. Through my photography, I am able to truly connect with my surroundings in nature and post-process creatively using adobe Lightroom/ photoshop. Through this process of creating fine art, I experience a joy and satisfaction that is indescribable. It is awesome to continue growing and evolving through experience and education. I would really like to expand my skills by attending AdobeMax and by gaining exposure to unique perspectives of other creative minds. A tad rusty on the latest updates, Photoshop, especially. And need to do a new website!